At the sound of the fire alarm, the fraternity house cleared out within 40 seconds. Half its occupants fled to the rear of the large home, and a small group gathered out front as an Ann Arbor Fire Department truck rolled up, lights flashing and sirens blaring. Their evacuation method was exactly what Jim Rampton, community disaster education coordinator for the Red Cross, cautioned the residents against doing in the event of a real fire. 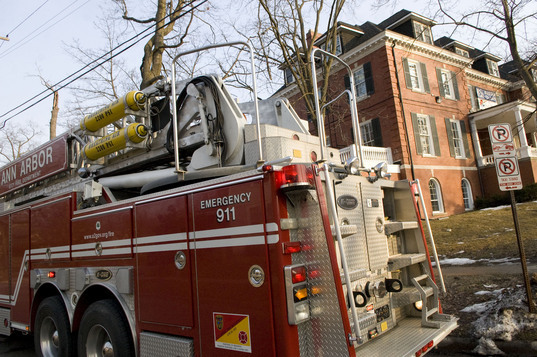 In this case, it was a surprise fire stimulation being used to test the fire safety preparedness of some of the University of Michigan fraternity and sorority houses in the city. The new initiative is a collaboration between the Washtenaw County Red Cross chapter, Ann Arbor Fire Department and U-M’s Greek Life organization. The purpose is to educate fraternity and sorority houses on the necessity for fire evacuation procedures and protocol. Rampton used it as a lesson to inform the Delta Phi Theta members of the correct way to evacuate a burning house. “If you take one thing away from this, it’s have a designated gathering spot out front where you all can account for one another,” Rampton told the roughly 26 residents. Rampton explained fraternities and sororities are particularly at risk because so many students live in a small area. At Phi Delta Theta, 26 students live in 12 rooms, and Rampton added many of them are living on their own for the first time. Rampton also pointed out the University of Michigan has the oldest and one of the largest Greek networks, and many of the houses are more than 100 years old. That means they’re prone to burn quicker with all the wood and insulation inside. Rampton said Greek houses differs from dorms, which are typically better regulated by the university. He called the simulations an effective tool for preventing a tragedy. The Washtenaw County Red Cross chapter and city Fire Department are arranging simulations throughout the Greek community with only the house president aware, leaving the others to suspect it's a true emergency. To add to the authenticity, an AAFD truck rolls up, along with a Red Cross emergency vehicle. Once the firefighters are out of the truck, and the residents are informed about what’s taking place, they all meet inside to discuss what happened and how to improve evacuations. Rampton said he hasn’t been particularly encouraged with the reactions thus far, but is optimistic the initiative will improve the situation. In the case of Phi Delta Theta, at the corner of Washtenaw and South University avenues, the students' reaction to the fire alarm was both positive and negative. While the fire alarm and fire extinguishers had been inspected by the fire marshal three months earlier, not everyone had been properly trained on how to use them. More importantly, the house didn't have an evacuation plan or system for accounting for its occupants. “We hadn’t really thought about it before, but that’s one of the things we can do now,” house president Tom Hardenbergh said, holding up a packet containing Red Cross suggestions on improving evacuation procedures and statistics on fires in university homes. Hardenbergh added he was pleased with how quickly everyone reacted and gathered in groups, but believes it can be accomplished in a more orderly fashion. “We know everyone has a sense of what to do, but we were not as organized as we need to be,” he said, adding that developing a plan will be placed at the top of the priority list. Ann Arbor Fire Captain Jim Budd also made several recommendations. He pointed out the fire doors meant to prevent flames from spreading from room-to-room were propped open. He also said if an emergency occurs, house officials should clear the building immediately and have a sober representative work with fire officials, which he said has presented problems on previous calls to fraternities and sororities. “What I ask from you gentleman is that you treat firefighters with respect,” he said. In 2008, a fire at a fraternity house near campus gutted the historic home - but it was during the summer, so few people were living there at the time. No one was injured. “That was what spurred on this idea - looking at those pictures of that house,” Rampton said. FEMA statistics show there were 3,800 university housing fires between 2005 and 2007. Of confined fires, roughly 80 percent are cooking related. Intentionally set fires, open flames and unintentional fires comprise the bulk of uncontained fires. Tom Perkins is a freelance writer for AnnArbor.com. Reach the news desk at news@annarbor.com or 734-623-2530 begin_of_the_skype_highlighting 734-623-2530 end_of_the_skype_highlighting.